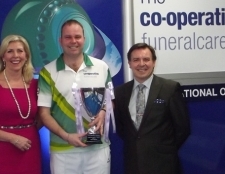 Huge congratulations to Henselite sponsored player Paul Foster MBE on winning the Co-operative Funeralcare International Open at Blackpool Newton Hall IBC. The World No.1 defeated Henselite stablemate and defending champion Alex Marshall MBE in a cracking final that was screened live on Sky Sports for the first time ever. “I’m delighted to win here in Blackpool. I was so disappointed to lose here in the first round last year, so I just wanted to come and play well and I’m over the moon to win the title.” said Foster.